I first began watching ‘Star Trek’ when I was 10. I watched the original programs as they were broadcast. I watched some of the other series over the years, but the original episodes remain my favorite. I was never a ‘Trekkie’ per se, but I did attend an event at college where James Doohan was the speaker. The auditorium was packed. He was a real star and fielded many questions. Everyone loved him. So naturally I was disappointed not to see him on the 'Star Trek 50th Anniversary Commemorative Issue' just issued by ‘TIME.' Maybe the PC crowd at ‘TIME' thought he would make one white man too many. Fine. I thumbed through the slick magazine and came across a Trump slur. What does he have to do with Star Trek? ‘TIME' compared him to an alien species known as the Ferengi. They are greedy, ugly capitalists. Some wag at ‘TIME' couldn’t resist and so their own biased politics were allowed to pollute the commemorative. 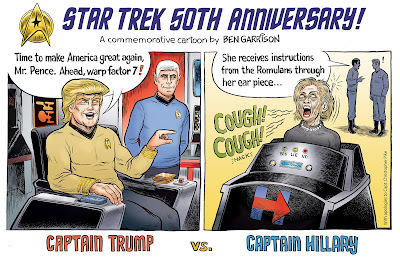 With that spirit in mind, I decided to draw my own 'Star Trek' commemorative—a cartoon. 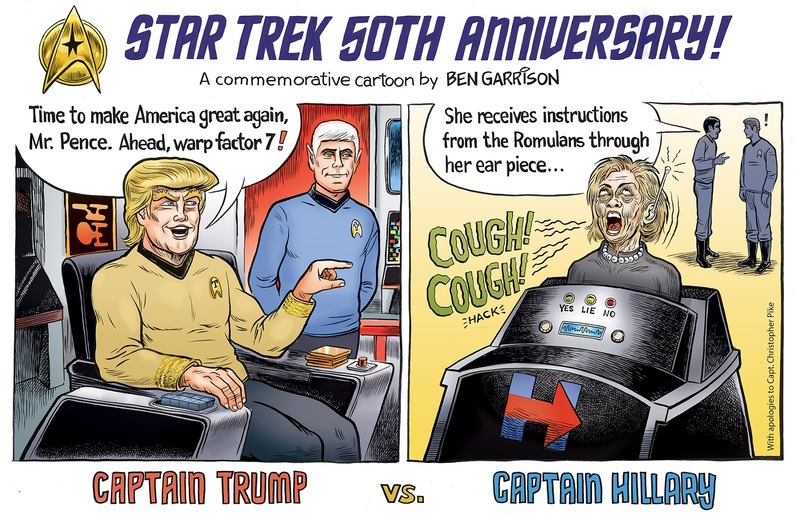 Now if Hillary were in 'Star Trek,’ who would she be? A blue Andorian with antennae? A Danebian Slime Devil? No…that would be too mean. She needs to be part of the Federation and someone of lofty rank. So I made her a Captain. A captain similar to Christopher Pike, only without his honor and courage. P.S. Special thanks to Jeff Rense for using my cartoons in his video with Joel Skousen.